I'm pleased to report the Queens Ledger published my write up of the Cronut! I've included the text in case the link doesn't work! Cronuts. It’s fun to say. Cronuts - the croissant/donut hybrid pastry that has taken the world (well, NYC) in a manic, insanity-filled storm. For those of you that have been hiding under a culinary rock and have no clue what I’m talking about, here is a short primer: Dominique Ansel has a small bakery in Soho. He has won several prestigious pastry and dessert awards. He created the Cronut in May and it has been featured on websites, the Chew and the NY Times. It is croissant dough, shaped like a donut, filled with a pastry cream and glazed. The Cronut sensation has people lined up outside his bakery hours before it opens. They are $5 a piece, there is a limit to two per customer and there are only 200-250 made a day. This dynamic has caused Cronut scalpers to sprout up; there are reports that people are paying $100 per pastry. So when I decided to come to Queens for a visit, I knew it was my duty to experience the Cronut. I rolled out of bed at 5:30 a.m. on Saturday morning, and by 6 a.m. I was driving across the Williamsburg Bridge. My gracious, but blurry-eyed host Wendy, begrudgingly joined me in my mission. We arrived at 6:12 a.m., 12 minutes behind schedule (they recommend two hours before opening) and we were 40th & 41st in line. I asked the guy at the front of the line what time he got there. “5 a.m.,” he proudly replied. We settled in to our beach chairs, armed with coffee and books, and we waited. However, at 6:45 a.m., Dominique Ansel came out and explained there was an electrical problem and the Cronuts would not be ready at 8 a.m., but at 10:30 a.m. The crowd started to get upset – were we going to have to wait almost four hours? Luckily, he was handing out tickets so that we wouldn’t have to stay in line - we could come back at 10:30 to claim our hard-earned Cronuts. I asked him how often this happened. “Never, this is the first time,” he replied. Lucky me. We killed time by consuming an amazing pastrami on rye at Katz’s, meandering though the Union Square Greenmarket, strolling though Washington Square Park and shopping at the MOMA design store. Finally it was 10:30 a.m. and we returned to the bakery. The line was short and contained within the actual store. We handed our precious tickets over the counter, to be authenticated and matched with the original. The woman in front of me asked what the tickets were for and the employee explained - she asked in a puzzled manner if she was going to be able to buy Cronuts. I almost laughed. The employee almost laughed. No, lady who got a full night of sleep, you are not going to be able to buy Cronuts, at least not legitimately. I tapped her on the shoulder and whispered that we might be able to help her out, as we would have an extra. We purchased our four precious Cronuts, packed in to two modern art-like gold pyramidal boxes. She followed us outside and offered me $10 for a Cronut. Like a drug deal in a back alley, we discreetly exchanged goods and money and she was on her way, pastry in hand. The verdict? I was underwhelmed. Wendy and I both thought the Cronut was extremely rich, bordering on greasy. I thought the lemon maple filling had a nice tart flavor, but no detectable maple goodness. 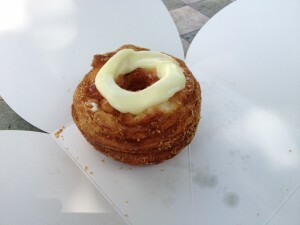 It also squirted everywhere when I bit down on the slightly tough layers of the Cronut. It’s a perfectly tasty baked good, but it’s not worth the two-hour wait or buying it on the black market, so feel free to sleep in. Gloria Tsoi lives in Boston and blogs about her eating adventures at gltsoi.livejournal.com, where she recently wrote about a visit to Flushing's Biang! So I'll just stick to my 1 dollar peanut butter cups.